Hello everyone! 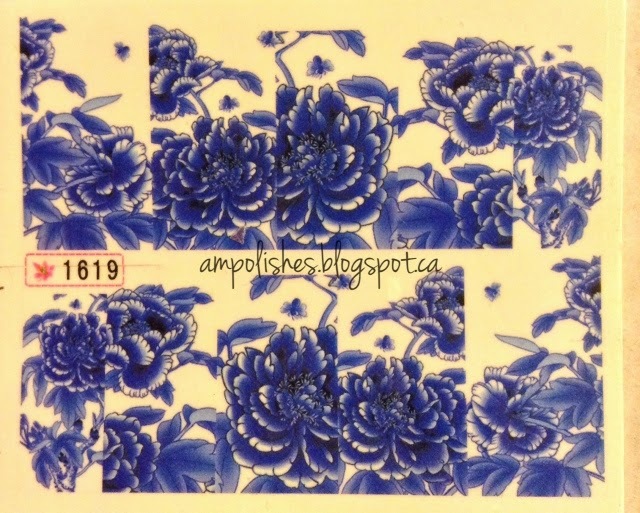 Today I have the N.NAIL Dejected Sad Tear Blue Bee Peony Nail Water Decals from KKCenterHk to share with you all. Not sure why this product has such a sad name because I thought the flowers were really pretty and the colours/pattern reminded me of delicate teacups or expensive china plates. The sheet of decal is priced at $2USD and comes with 10 rectangular boxes which you then cut accordingly to the size of your nail. It does take a bit more work compared to preformed decals but this way you get a more custom fit since not all nail beds are of average size. I used some Jamberry nail shield I had lying around as a shape guide. I then refined the cuticle end of the decal to create a nicer round edge. Be sure to start out with a white base. Application was very easy, the decal became free from the backing after being in water for 15-20 seconds. A tip I always like to give is to wet your nail before applying the decal. This will allow you to reposition the decal until you are happy with where it is placed. Once positioned I use a cotton pad to absorb the water and adhere the decal. A topcoat is needed to seal everything in place, if not the decal will chip or start to lift in the free edge. In my pictures below you can sort of see the decal curl on my middle finger on the cuticle edge. If the decal is not firmly in place the topcoat eats away at it. That's why it's very important to firmly press downwards with a cotton pad when absorbing the excess water. This way the decal adheres to the base polish. 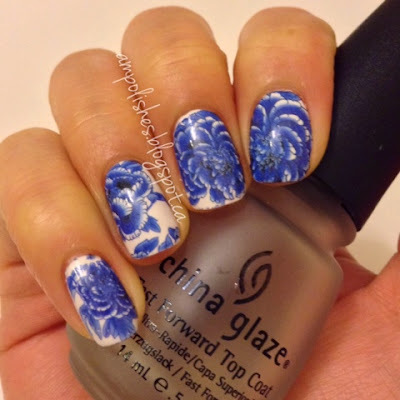 When applying topcoat be sure to have enough polish on the brush to go over the nail once. Excess brush strokes may cause the image to streak.